Lucha Libre Taco Shop offered the perfect taste of San Diego for lunch on Friday. Let me cut right to the chase. In my previous blog post about my first few days in California, I omitted my absolute favorite part of the trip. The food. I love me some food. I consider myself an avid fan of the Travel Channel’s Man V. Food and countless Food Network shows. I’ll write in significantly more depth at some point about all the different Man V. Food restaurants I have eaten at over the years, but I added two more to the list over my first two days in San Diego. Lunch yesterday was heavenly. It’s that simple. 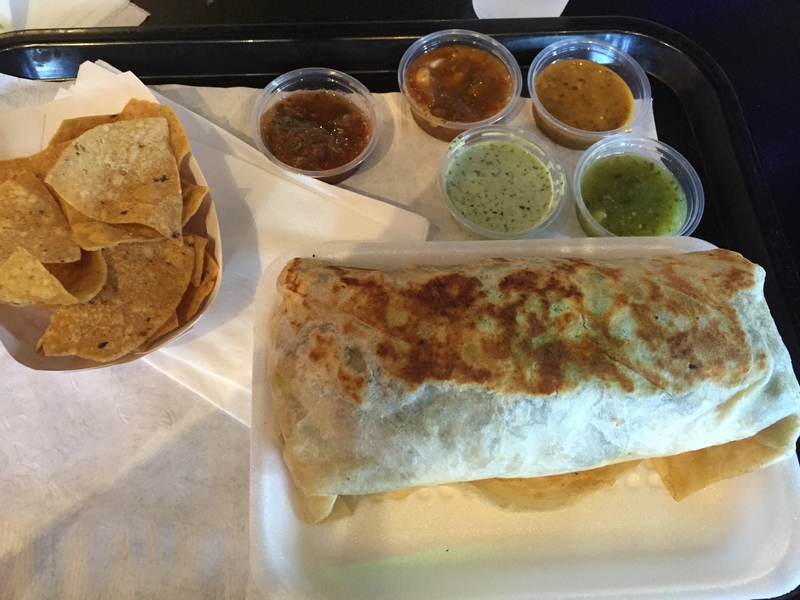 I ate at Lucha Libre Taco Shop and tried exactly what Adam Richman had, the Surfin’ California Burrito. Grilled steak, shrimp, fresh french fries, avocado, pico de gallo, cheese and super secret chipotle sauce. If that doesn’t sound good to you, well, you’re oh so wrong. If it does sound delicious, well it tasted 10 times better than it sounds. The Surfin’ California, featuring steak, shrimp, fries and avocado was the best burrito I’ve eaten. The carne asada steak is perfectly cooked and provides a perfect base flavor for the other ingredients. Nothing overpowers each other inside the warmed burrito, but the steak is clearly the star. It’s tender, flavorful and juicy. Next you taste the shrimp, which is a different texture and flavor than the steak, but it plays off it so perfectly. The richness and creaminess of the true California avocado was amazing blending all the flavors together and the Chipotle sauce was subtle, but just present enough to kick up all the rest of the flavors. I was initially worried about how the french fries would play inside the burrito, but though starchy and filling, the potatoes were bland enough that it took on the other amazing flavors mixed in and was an original and substantial replacement for rice. 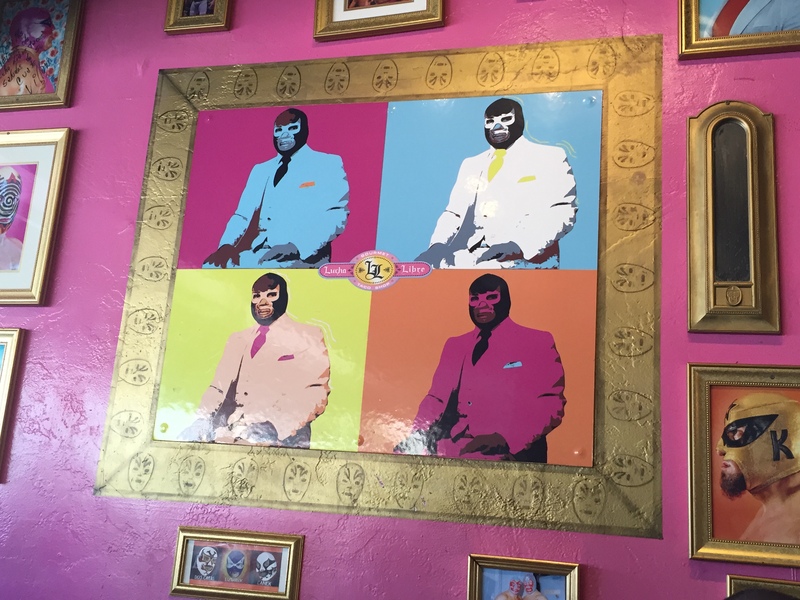 The restaurant itself was nice with Lucha Libre wrestler portraits, paintings and posters lining the wall inside the smaller than expected sitting area. There was outdoor seating which filled up quickly and a salsa bar to sample with the free chips. But at the end of the day, it didn’t matter if the place was a Lucha Libre theme or just painted the walls a boring shade of gray: the restaurant was an absolutely perfect taste of San Diego and that burrito was the best I’ve eaten in my 25 years. My only regret was being too full to try a taco. A few people next to me were eating them and they looked almost as good as my perfect burrito. The signage may not be fancy, the food is damn good. Saturday’s lunch was just as good. 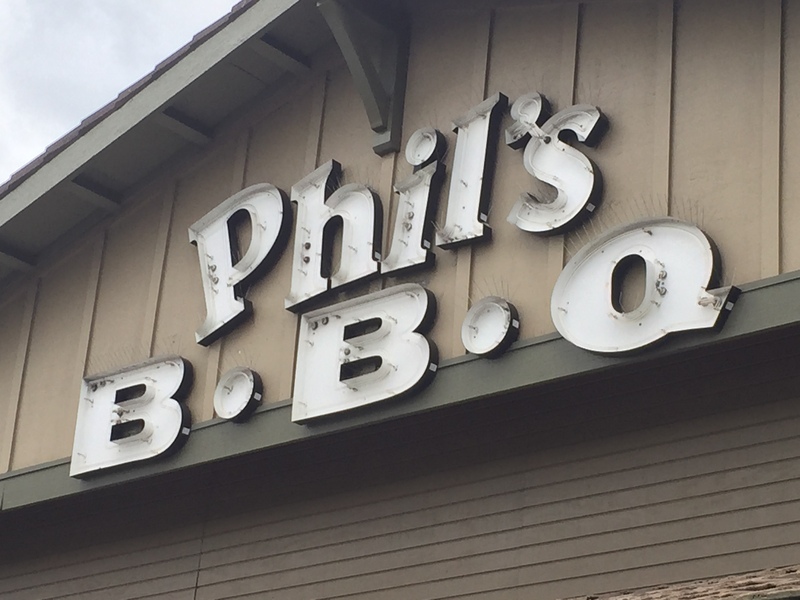 It would have been easy to be a let down following how perfectly delicious Friday’s lunch was, but Phil’s BBQ was up to the task. The line was out the door (literally) and wound around the side of the restaurant. I had to get back to watch some more games, so waiting was not an option and I chose to take my lunch to go. There were not enough napkins to go around after finishing this unreal meal. I ordered what Phil is famous for, his fall-off-the-bone ribs. And oh man, did they ever fall off the bone. The ribs were cooked to perfection, easy to eat and delicious to a point of delirium. I sat in my car savoring each rib hoping that they would magically keep reincarnating so the enjoyment would never stop. Once the ribs, perfectly sauced for the record with a flavor I would say most closely resembles a Carolina BBQ flavor, disappeared, it was onto the tri tip beef, a SoCal BBQ staple. Tri tip is a lean cut of beef that comes from the bottom sirloin of the cow. It is mesquite smoked, sliced thinly and takes the flavors of the barbecue sauce well. It was a nice beefy taste to compliment the sweetness and fattiness of the pork ribs. 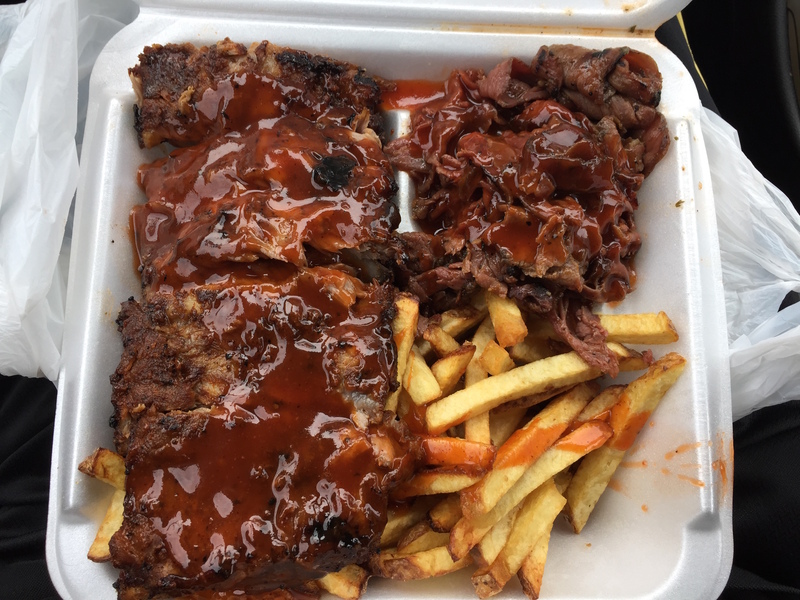 The meal came with two sides, an overwhelming amount of french fries, which were fries, good, but smothered in the barbecue sauce made them great and sweet baked beans, which I loved. I will not be trying the Ironman Challenge. Looking at the menu, I definitely want to try an omelette and I think I’ll go with the John Wayne, essentially a normal sized version of the Ironman. I’ll be sure to update you on that trip at some point in the future. While the basketball and weather in San Diego was good, the food was GREAT! This entry was posted on June 28, 2015 by Coach Sass in Miscellaneous.